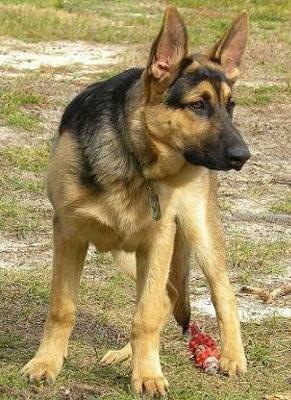 This story is about my German Shepherd Leon, that’s his name. Eight years ago I and my mom went to get a pet for me. I wanted a big dog and decided to go with a German shepherd. There were two German shepherd pups in the store. I wanted to pick the one who ran to me. I was so thrilled that he picked me. Only later I knew he wet my shoes! I took him and we were on the way back thinking about a good name. Our taxi driver suggested the name Leon for him and we like that name. Mom asked what the driver’s name was and he said it was Leon too! Laughing all the way back we bought a small collar and a chain for him. Leon grew really fast and he has a big appetite. His greatest enemies are birds, squirrels and garden lizards. That is when he uses his energy for chasing and running. We can see the fire in his eyes when chasing. He is afraid of rain and thunder. Whenever there is rain Leon is under my bed! People in my street are very afraid of him as he is big and looks ferocious. We only know how funny and loving a dog he is.